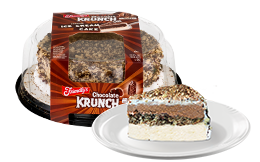 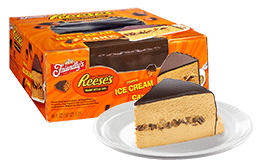 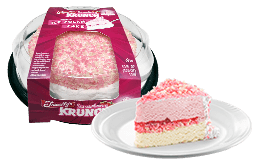 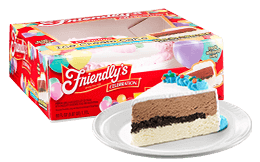 Create your own ice cream cake masterpiece with Friendly’s Crayola Ice Cream Cake! 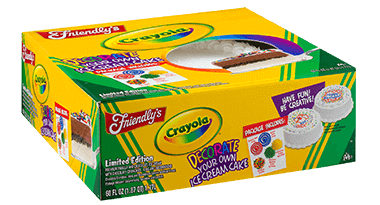 Sprinkle your cake with rainbow confetti shapes, brightly colored sprinkles or write a message in blue and red icing! 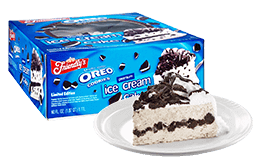 Milk, Cream, Vanilla Flavored Icing (Water, Vegetable Oil [Partially Hydrogenated Palm Kernel], Dextrose, Corn Syrup, Sugar, Sodium Caseinate, Polysorbate 60,Cellulose Gum, Natural And Artificial Flavor, Salt, Soy Lecithin, Poly-Glycerol Esthers Of Fatty Acids, Xathan Gum, Colors*), Skim Milk, Sugar, Chocolaty Crunchies (Bleached Wheat Flour, Sugar, Cocoa [Processed With Alkali],Palm Oil, Corn Syrup, Corn Flour, Soy Lechithin, Baking Soda, Salt, Natural And Artificial Flavors),Corn Syrup, Whey Protein Concentrate, Cocoa (Processed With Alkali), Guar Gum, Vanilla Extract,Mono And Diglycerides, Xantham Gum , Carrageenan, Annatto And Tumeric Extract (Color).